The magnitude of the president’s response on the TJRC report; the 10 billion shillings Fund to be used for restorative justice should be executed. On 3rd May 2013, the Truth, Justice, and Reconciliation Commission (TJRC) presented its final report to President Uhuru Kenyatta. The TJRC recommended that the President issue an official, public and unconditional apology to women, children and minority and indigenous communities in Kenya whose rights were grossly violated and for the State’s systematic discrimination against these groups and communities. Despite the president’s dalliance in conveying the apologies which were to be done within six months of the issuance of the TJRC report, he finally did recognized the report on Thursday, 26, March, 2015 during the State of the Nation address. Established in the aftermath of the harrowing events of the 2007/2008 post-election violence, the TJRC was tasked with inquiring into gross violations of human rights and historical injustices that occurred in Kenya between independence on 12th December 1963 and the Coalition Agreement signed on 28th February 2008. 7. Creation of a National Human Rights Day on 10 December to coincide with International Human Rights Day. The president’s apology seeks to respond to the first recommendation, we believe that the other recommendations shall be addressed and most particularly recommendation number 7, “creation of a National Human Rights Day on December, 10 to coincide with International Human Rights Day.” We believe that all factors in the interest of pursuing peace, promoting access to justice, and enabling reconciliation will be expedited. The end product, a report comprising over 2200 pages, is structured into four separate volumes: the first volume (Volume I) provides an account of how the TJRC was formed, how it interpreted its mandate and what challenges were faced whilst carrying out this mandate; the second volume (Volume II), itself divided into three sub-volumes, focuses on the major violations of bodily integrity committed during the mandate period (including unlawful killings and enforced disappearances, unlawful detention, torture and ill-treatment and sexual violence), historical injustices and violations of socio-economic rights, and violations against groups entitled to special protection, including women and children, as well as minority groups and indigenous communities; the third volume (Volume III) addresses issues relating to national unity and reconciliation; and the fourth volume (Volume IV) catalogues the TJRC’s findings and recommendations, including those relating to its implementation mechanism and reparations framework. 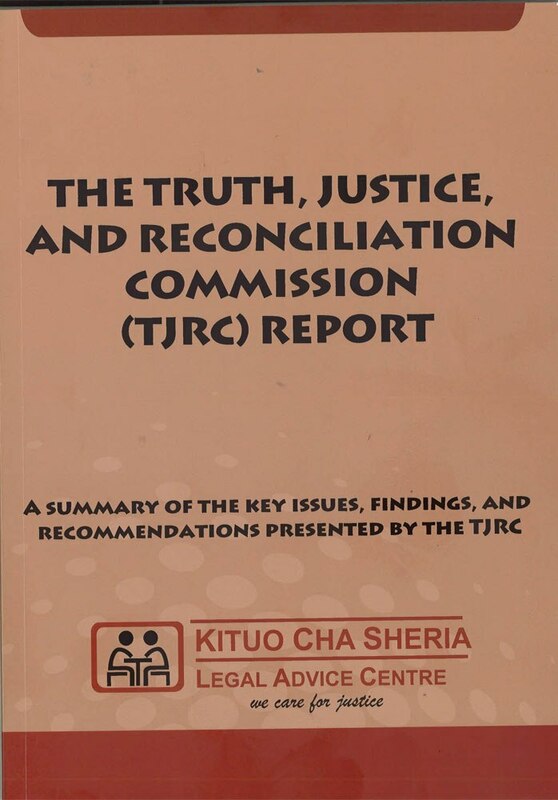 Given the lengthy, complex nature of the report, Kituo Cha Sheria through this publication seeks to encapsulate the key issues, findings, and recommendations presented by the TJRC. The purpose of this being to not only recognize the human rights violations perpetrated throughout the mandate period and to date, but to also provide a wider audience with access to pertinent information of this kind and allow for active participation in the reconciliation and healing process of the country. Posted on April 27, 2015 Categories UncategorizedLeave a comment on The magnitude of the president’s response on the TJRC report; the 10 billion shillings Fund to be used for restorative justice should be executed. The recent massacre in Garissa, previous terror attacks, banditry and other security risks in the country leave in their wake a bad taste in the mouths of Kenyans with the realization that the provision by the law, local and international, of the right to security is not enough anymore. The right to security of the person as guaranteed by Article 3 of the Universal Declaration of Human Rights guarantees or rather provides for the right to security of the person. It also provides for the right to life and liberty. The right to security of the person is also recognized by the United Nations Treaty, the International Covenant on Civil and Political Rights of 1996 which provides that everyone has the right to liberty and security of person. The Constitution of Kenya 2010 also provides for the freedom and security of the person under Article 29. The Right to the security and freedom of person cannot exist on its own as there are other rights that affect and are affected by this right. This article seeks to delve into the effects these events and risks have on the basic rights of the Kenyan citizen. The Constitution of Kenya under Article 26 provides for the right to life. Every Kenyan citizen has a right to be protected if his or her life is at risk. The threat of terrorism in Kenya is very real going by the trends and as such the government is at liberty and has a duty to each and every citizen to ensure that their right to life is well safeguarded and protected. As such there ought to be elaborate measures to ensure the safety of each and every Kenyan. 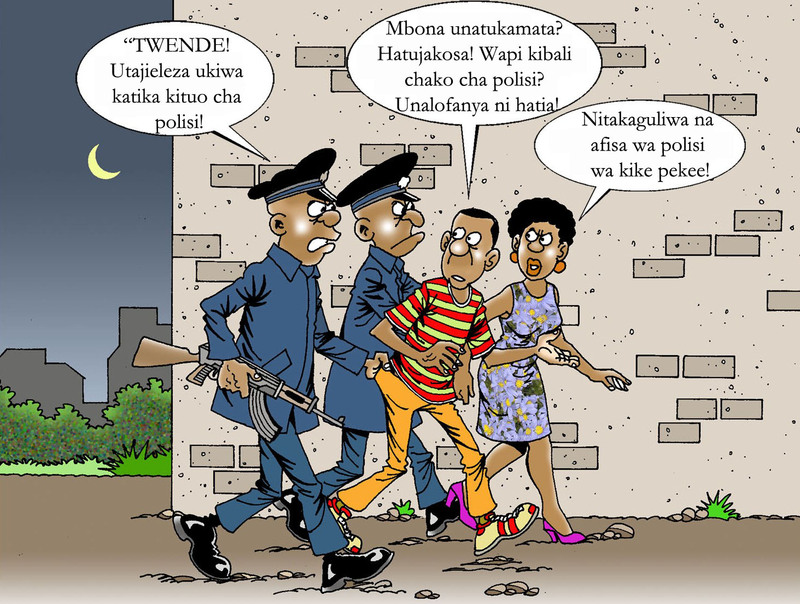 With each terror attack, banditry or any other security lapse in the country, a citizen’s right to life is violated. In matters security it is safe to say that the government bears the sole responsibility to ensure that its citizens’ rights are protected from all factors that threaten, infringe or extinguish this right from within and without. How? By use of the various security mechanisms that are necessary to ensure extensive gathering of intelligence, rightful use of resources allocated to security agencies, zero tolerance to corruption, abiding to the rule of law and most of all ensuring that the country has well trained personnel to tackle the threat. So far, the measures if any; have failed more than they have succeeded, in convincing the Kenyan citizens that their constitutional right to life is safeguarded and citizens are no longer at ease. The Constitution of Kenya gives every person the right to freedom of movement and every citizen the right to enter, remain in and reside anywhere in Kenya. This right especially for the civil servants in Northern Kenya and other citizens who may have interests in property or invested there has of late proven elusive. Every person has a right to work and live or own property anywhere in the country. Insecurity is an impediment to this right as it prevents a person from making meaningful living or earning a living in his or her place of work if this place of work lies within these attack prone regions of our country. The right to security if lacking will not only affect other people but also the local communities in the affected areas. Insecurity extinguishes employment, investment and development opportunities in the affected areas. While it may affect the non-locals working there, it adversely affects the local community and may even lead to increased breeding room for other attackers. “Hopelessness is a dangerous thing”, they say. This is at the epicenter of the narrative of most terror attacks. Kenya has a majority of Christians at almost 80%. This notwithstanding, the threat of terrorism is proving to be a great headache for Christians and peace loving Muslims as terrorist propagate their divisive agenda. As provided by Article 32 of the Constitution, every person has the right to freedom of conscience, religion, thought, belief and opinion. Due to insecurity threats and attacks, primarily ethnic Somalis have unfortunately been harassed, profiled, discriminated against, and generally found it hard to access several services, gain employment, get identification documents among others. The freedom of religion in this instance is greatly compromised for both Christians and Muslims alike. Though a fundamental right therefore, religious affiliation is adversely affected when the right to security is infringed upon or threatened. Especially when religion is used as a scapegoat for committing such atrocities as recently witnessed. The Constitution of Kenya Article 43 (a) and (f) respectively provides that every person has the right to the highest attainable standard of health, which includes the right to healthcare services, including reproductive healthcare and the right to education. The world witnessed the macabre sight of the Al-Shabaab terror group massacring 147 young Kenyans in their campus. Their Constitutional rights to education and life were snuffed at once by the state’s systematic failures on security. Besides that the country also witnessed similar inhumane killings on a bus full of mostly teachers who were travelling home for holiday and the subsequent back and forth on whether these same teachers could resume duty. With the killings of mostly Christians this form of terrorist agenda and insecurity not only drives out people from institutions like schools and hospitals in the affected region but also hinder the locals, mostly Muslims, from accessing their rights. It is important to note that whether insecurity is fuelled by religious extremism or banditry or any other form of attacks on the citizenry whether from within or without, the rights guaranteed by the Constitution affect both the targeted and the untargeted. The real question is; is the provision on these rights sufficient? Kenya as a country must ensure that in order to safeguard these rights, our infrastructure, our politics, our development agenda, our policing, our systems and our resources are not the driving force that keeps these vices up and running. End corruption, discrimination, petty and divisive politics, marginalization and profiling. Let’s embrace oneness. One Kenya. So as to attain Justice and what is rightfully yours, one has to be patient and persistent. Mercy Njeri was married to Peter Mwangi Muchoki in December 1986 and they were blessed with three children. At the existence of their marriage, through their great exertion, they jointly bought a plot from the City Council of Nairobi whereof they constructed 12 houses, lived on some and rented out the others for their income. Sometimes in 2008, their marriage began experiencing turbulence and thus they separated. It is during this time that the then husband started mistreating the family and even assaulting her. In the year 2010, Mary complained at the Chief’s office that Mwangi was collecting the rent from all rooms and spending all of it without giving the family anything for their basic needs. The Chief and the area leaders arbitrated on the matter whereby the parties agreed to divide equally the plot and each to have 6 rooms to be collecting rent from. Mary was therefore able to get an income of Kshs 8,300/= per month from the houses she was collecting rent and which went a great mile in assisting her and the children meet their basic needs. At this moment in life if you were Mary what would you do? When all is gone and nothing left to keep her going with the children who needed clothes, food, shelter and school fees. In crutches, having nothing to even settle her hospital bill, she was disillusioned! Embittered and all hopes vanishing, Mary did not know what to do; she decided to seek legal assistance on the matter of the accident. A police officer had earlier proposed to try and get assistance from Kituo Cha Sheria. She came to Kituo as was directed, very optimistic to get help. She was received and directed to Kituo Gardens waiting to be attended to. This is where she overheard a conversation by other clients at the waiting shed; the client whom she did not know was telling his fellow how Kituo rescued his property from a grabber who used his wealth and money to bribe every avenue just to own his small piece of land. Mary felt this is an opportunity to grab, “I must tell whoever will attend to me my predicament,” she said to herself. She met Nathan Kivungi and Simon Kimondolo who derived two matters from her situation; that which concerns the accident and another on the selling of the plot. Mary did not have money at all so Kituo assisted her apply to be allowed to sue as a pauper (an impoverished person) on the matter that involves her houses and the order to that effect was issued in 2013. Later Kituo assisted her in filing the ELC case on January, 23, 2014 and Kituo lawyers represented her in Court following up the matter to the latter in ensuring justice is granted. i. That the plaintiff is entitled to half share of the suit property being the plot. iii. Lost income of Ksh. 8,300/= per month from November 2011 until payment in full. v. Interests at court rates. Mary was so happy to get back her lawful property and in addition a total sum of Ksh. 448,600 thus Ksh. 348,600 as compensation for lost income since November 2011 to April 2015 (42months) and further Ksh. 100,000 being general damages for trespass. Further, the Judgment in effect has restored her ownership meaning that as from the month of May 2015 onwards, she will be collecting her usual rent of Ksh. 8,300 per month or more from her 6 houses. 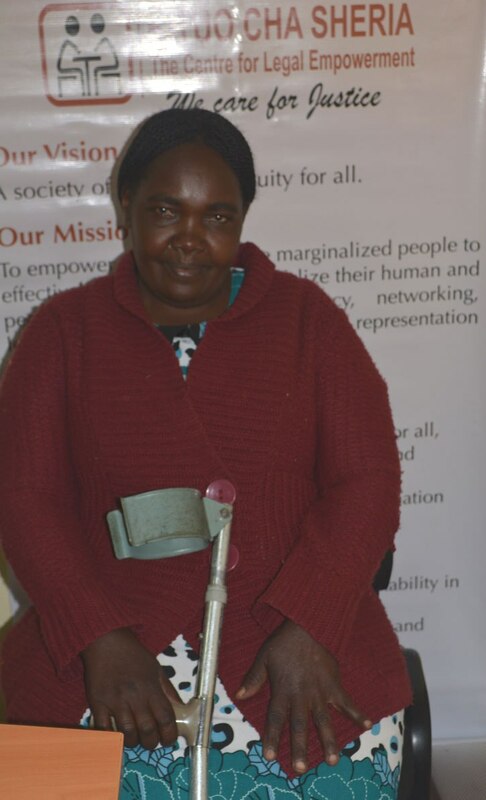 “I am grateful to Kituo Cha Sheria; you have restored hopes to the hopeless,” she acclaimed to Simon Kimondolo, Kituo’s lawyer who represented her throughout the Court sessions as she collected the Courts order. Lesayon Saigor, and Jairo Sila, Kituo Cha Sheria. “No work is insignificant. All labor that uplifts humanity has dignity and importance and should be undertaken with painstaking excellence” by Dr. Martin Luther King, Jr. It is imperative to understand and know your labour rights; this can be found from the Kituo Cha Sheria’s (Kituo) Publication titled the Kenyan Worker and the Law, an information booklet on labour law. The Employment Act, 2007 clearly stipulates the terms and condition of engagement between the Employer and employee sections 8,9 and 10 of the Act talks about the contract of service whether written or oral. The encounter by Kituo’s paralegal officer, Mr Stanslaus Alusiola clearly shows how employers exploit their employees especially the poor and marginalized who may be ignorant of their rights. If it were not for Kituo’s Kibera Community Justice Centre the ignorant Lesayon Saigor who did not even know the name of his employer could have had nothing to smile about, his story should act as a bridge to fight against impunity and injustices encountered in the employment sector. Lesayon Saigor was employed as a guard in Autodrome Services Limited in Westlands since October 2013. He remained diligent to his work oblivious of what awaits him. He encountered his mayhem on 5th of March, 2015 at around 11.00pm in the night when he was dismissed without any notice. The company had not paid him some of his dues for the service and sacrifice he had made to them. He was not very familiar with the steps to undertake to mitigate this situation. He pleaded with the company to pay him his dues but the company could hear none of his pleas. He sought to seek legal assistance from Kituo’s Kibera Community Justice Centre where he met the Coordinator, Mr. Stanslaus Alusiola on March 11, 2015. With the vast experience in Paralegalism, the Coordinator deemed the matter a gross violation of the employee’s right by the employer. He immediately resorted to taking action in ensuring justice is done. He decided to write to Saigor’s boss to seek clarification on the matter and assist his new client, Saigor. They never responded to the letter. Mr Alusiola therefore decided to visit the company with a demand letter citing legal aspects on the labour law to prove violation of Mr. Saigor’s labour rights. Kituo through its able advocates were ready to move to Court to file suit if the Demand did not bear fruit. However, the company manager accepted to settle the matter out of Court and agreed to pay Saigor all his dues with immediate effect. Later on, the Community Justice Coordinator received a phone call from the Autodrome Services Limited Company claiming that they have to do some deductions of which the management did not explain. A matter that the Coordinator strongly refuted due to the fact that the guard was arrogantly dismissed at night endangering his life, was not given any notice and received not his final dues. He opted to pursue the matter and ensure justice is done. Accepting defeat, the company through the manager, Mr. Alex Karanja pleaded to settle the matter without involving Court and accepted to pay all the dues without any deductions to the employee by 9th of April 2015. 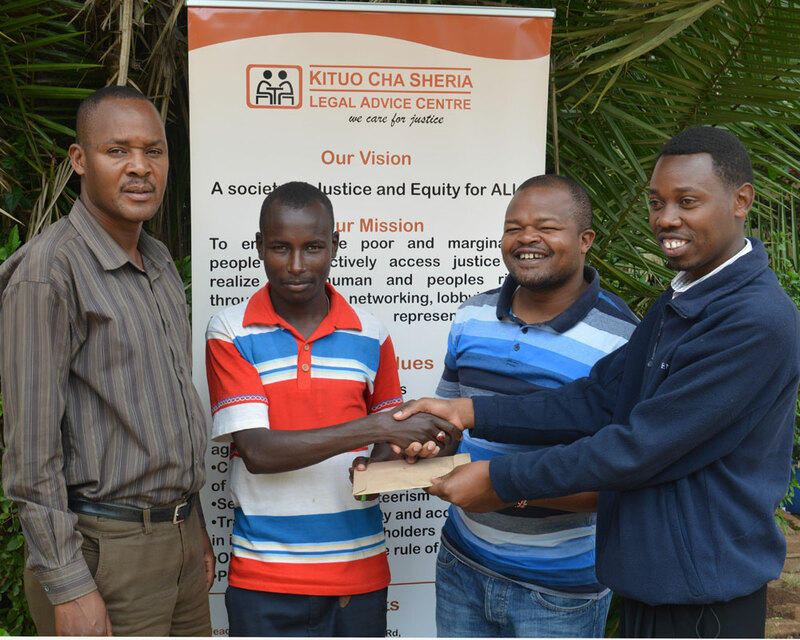 Lesayon Saigor was all the smiles and thanked Kituo Cha Sheria and more so Kibera Community Justice Center Coordinator, Mr Stanslaus Alusiola for the relentless effort in ensuring he is accorded his dues. “I am happy today, I can use this money to stabilize myself as I seek for a job elsewhere, thank you Kituo Cha Sheria,” he acclaimed! This booklet seeks to provide Kenyans with information about their rights in criminal proceedings. The rights in this manual are premised on the provisions of the Bill of Rights in the Kenyan Constitution and related legislation. Criminal Proceedings- A criminal proceeding is a public dispute. In such a proceeding, the State prosecutes a person for committing a crime on behalf of the public. A criminal proceeding is different from a civil proceeding because civil proceedings generally involve disputes between two private individuals, one of whom is seeking compensation from the other. When you are arrested, criminal proceedings begin. The process continues until you are found innocent or guilty of a crime. If you are found guilty, the proceedings may continue if you decide to appeal the decision. Who has the power to arrest? Citizen, Law Enforcement Officer, the Chief, Magistrates and Order of a Court. Kituo Team, We Care for Justice. Kituo Cha Sheria(KITUO) with support from MacArthur Foundation has been implementing a project on environmental and human rights protection as a result of oil production in Turkana County. A baseline survey and MTE carried out on this project revealed a number of critical environmental and human rights issues in the extractive industry that require much attention. In order to address some of the human rights issues identified above, it was proposed that awareness on issues such as land, labour and environmental rights be created so as to empower local communities to demand for transparency and accountability with regards to oil exploration. 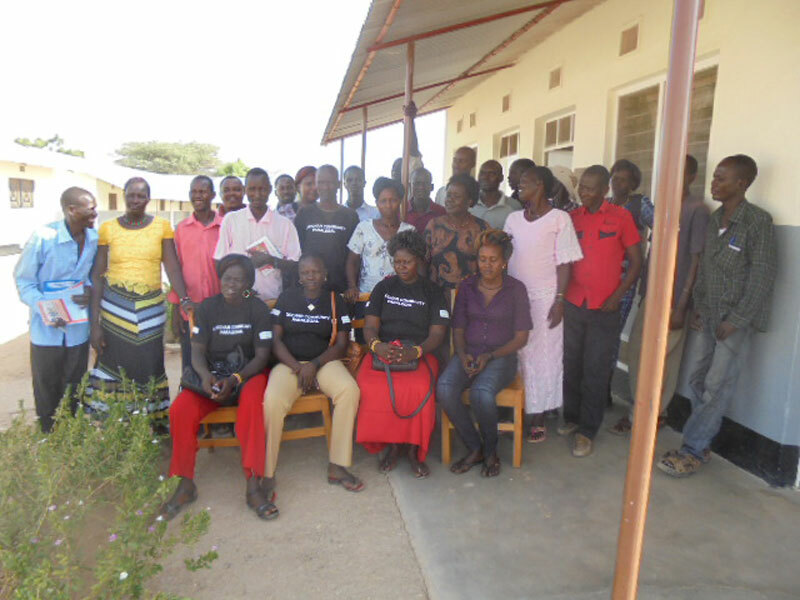 In furthering the objectives above, KITUO facilitated paralegal training for Turkana paralegals in Lokichar, Turkana County from 10th to 14th March 2015. 30 participants, 20 male and 10 female were trained. The training was spearheaded by Kituo staffs Ashioya Biko and Marcelino Waithaka. Brief introduction on Human rights. Sources of the law in Kenya. History and background of the extractive industry in Kenya with emphasis in Oil exploration. National Energy Policy and analysis of the Petroleum (Exploration and Production) Act. Drafting of Demand Letters; The paralegals were trained on how to draft a demand letter generally and the importance of drafting it. Overview of the Current legal regime governing land in Kenya with specific emphasis on Land adjudication and Compulsory acquisition. Discussions on the establishment of proposed Kituo Community Justice Centre in Turkana. KITUO TEAM – WE CARE FOR JUSTICE! 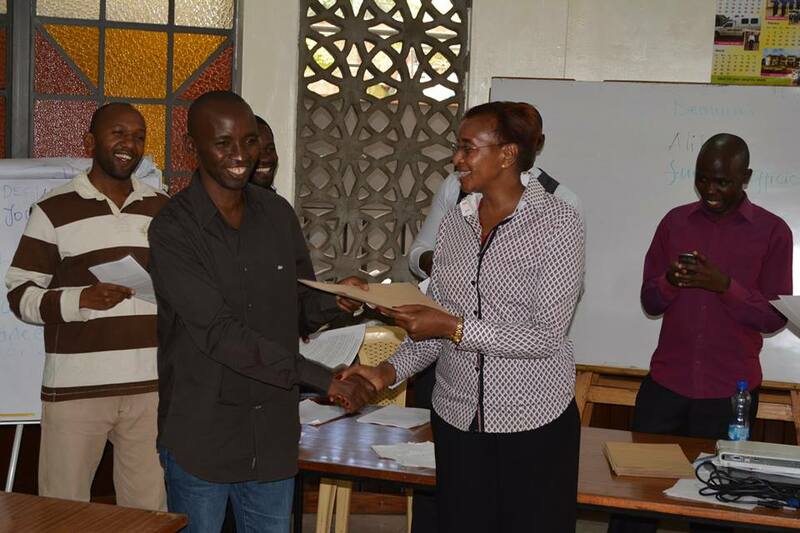 KITUO enhanced her long standing partnership with the Kenya Prisons department by facilitating a paralegal training for prison warders in conjunction with Faraja Foundation from 23rd to 27th March 2015. This training workshop was held at Our Lady Queen of Peace Catholic Church, South B. 40 prison warders drawn from the following remand facilities underwent paralegal training; Athi River, Kangeta(Meru), Kiambu, Kitui, Langata, Makueni Remand, Nairobi Medium, Nairobi Remand, Narok, and Thompson Falls Prison. Also in attendance were two staff from Faraja Foundation and 2 legal officers from Prisons’ Human Rights Department Hq. The workshop was officially closed on Friday 27th by Madam Wanini Kireri, Senior Deputy Commissioner of Prisons and the Regional Prisons Commander-Nairobi. In her closing remarks, Madam Wanini disclosed that a research conducted late last year indicated that prisons are overpopulated(exceeded their holding capacity) by 80%. “The knowledge and skills in human rights training and paralegal skills imparted is critical in aiding the department in decongesting” added Madam Wanini. In addition, a significant number of remand inmates are not aware of their legal rights and obligations and the knowledge gained would aid in filling this gap. Finally, she presented certificates to participants together with Fr. Peter Meienberg, the Founder of Faraja foundation.